Anchorage police say they plan to target petty drug deals and return to foot patrols in some neighborhoods to foil the kinds of crime that victimize the most people — thefts and burglaries. At a Thursday news briefing at the Mountain View Boys and Girls Club, officials also said more officers are being sent to patrol neighborhoods that have increasing reports of gunfire. 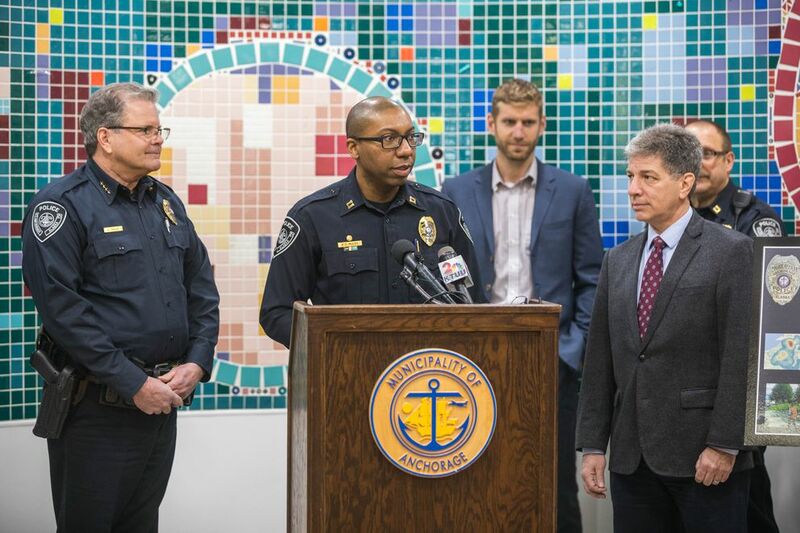 The three-pronged "action plan" marks the latest effort by the administration of Mayor Ethan Berkowitz and the Anchorage Police Department to battle rising crime. Speaking at a lectern, Berkowitz described the plan as one of the first "dividends" of hiring more cops, a promise he made during his mayoral campaign tied to growing community concern about crime. The mayor boosted the police budget by $3.1 million in 2017 to add more than 50 new officers to APD while cutting back on other city services. Over the past year, police recorded a dramatic rise in property crime, including burglary and a record level of car theft, said Deputy Chief Ken McCoy. "We believe a lot of this crime is driven by an increase in drug use," McCoy said. Police also believe drugs are connected to violent crime, said another deputy chief, Sean Case. To arrest more drug dealers, officers with the city's Community Action Policing Team are focusing on street-level drug distribution, Case said. New officers added to the CAP team in the past year immediately started training on drug detection and enforcement methods, Case said. The long-standing APD vice unit will focus on in-depth drug investigations, taking around two months or more, Case said. A police unit focused on breaking up "hand-to-hand drug deals" — small quantity sales — disbanded about two years ago, Case said. He and other officials believe the absence of that unit has helped allow drug problems to proliferate. Case said property crime detectives recently told him it's rare that people steal because they're out of luck or need to eat. Rather, the detectives told him, the motives "pretty much always involved with drugs." Police officials declined to discuss the strategy for targeting drug dealers in detail, saying enforcement techniques needed to remain secret to avoid tipping off targets. But Justin Doll, captain of the crime suppression unit, indicated it would be "more directed" than patrolling and making arrests based on an officer's observation. And, with the hope of preventing crimes, the department is also sending out more officers on foot, Case said. In November, police resumed foot patrols downtown after a long hiatus blamed on staffing shortages. Last week, the foot patrol program expanded to the Mountain View, Fairview and Spenard neighborhoods. "These are the neighborhoods we find ourselves coming into over and over again," Case said. Part of the job of cops on the beat will be to chat with residents in a nonenforcement way and follow up on crime reports, Case said. He and other officials said the main goal will be building relationships with residents. "What we expect is more stop-and-chat, not stop-and-frisk," said Doll, who oversees the CAP team. Two officers will be teamed up on each shift to walk the neighborhoods. Case said the goal is a net gain of 12 officers on the street by June 1. Case acknowledged property crimes, in particular, are affecting residents in neighborhoods across the city, from Eagle River to South Anchorage. He said he's hoping the focus on street-level drug busts will help drive down those numbers. Whether the efforts will be hampered by state criminal justice reform, which decriminalized many drug offenses, is an open question. The state Legislature's 2016 criminal justice reforms, sometimes called Senate Bill 91, have been blamed for some increases in crime. In an interview after the news briefing, Doll said the department hasn't seen the full effects of statewide criminal justice reform. Berkowitz, who was standing nearby, said the legislation is going through revisions this year in the Legislature. The mayor also said confronting drug issues is not solely a law enforcement problem. "The reality is, we need more detox facilities. There needs to be more drug and alcohol prevention," Berkowitz said. "I don't think anybody is under the impression you can enforce your way out of a drug problem," Doll added. But, Doll said, "this is our piece" of a broader puzzle.